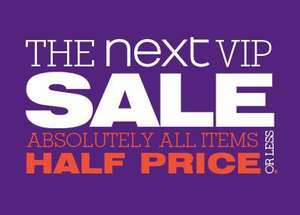 50% sale at NEXT, VIP sale starts Thursday, shops from Saturday. No luck here either. I did get an invite to the last one but I've really cut back on my spending, especially as the free delivery has been stopped. The only item of furniture showing is a side table was £225 now £95 and that is it at present. The mid season sale is always rather poor IMO. How do you qualify as a VIP customer? Its currently making me feel like a second class customer. Is that what they want? Hi, just booked slot : 19.30 tomorrow night, thanks!!! No - there seems limited furniture - a table and bedroom furniture, Stamford range wardrobe, drawers, cabinet. Not as extensive as winter sale but typical for spring. No - there seems limited furniture - a table and bedroom furniture, … No - there seems limited furniture - a table and bedroom furniture, Stamford range wardrobe, drawers, cabinet. Not as extensive as winter sale but typical for spring. I am sorry that you were not selected to receive a priority e-mail to place your order over the internet prior to our Sale. •You must have an up to date e-mail address registered to the account and have previously agreed to receive sale and promotional e-mail literature. •You must have received a copy of the Directory. •You must have an active Next Directory flexible credit account with at least £250 credit available. •You must have placed and kept an order within the last 3 months. Next Directory customers who have returned the majority of their orders will not be eligible for a VIP appointment. All the above criteria must be met in order to be considered for the VIP sale however an invitation to participate cannot be guaranteed. Oh well, I don't want a credit account and neither do I want a paper based catalogue that they charge me for! Next seem to hang on to their old way of doing things which is odd. Me too - I made them take it back and they arranged for a courier to do so. What a waste of money! Yes it's on the Sale!!!! With all money I spent in Next, still didn't get an invitation. Anyway , most previous sales were really poor where they put mostly items that no one really wants to buy. Also where are the FREE DELIVERY codes that they used to have? not anymore. I was wondering if anyone who has access to the sale already if this cute flamingo bag is going in the sale? Just been to the NEXT shop and also to the website, this 'SALE' is rubbish. Most of these items where all these times under the 'offer' section on the website, so there is no real sale here. I noticed as well they raised prices on some items which were cheaper just a couple of days ago. Definitely not a SALE as they pretend to be.